A Hands-Down “Must Have” Product. 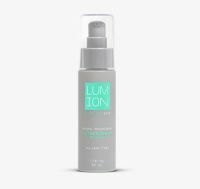 I can’t say enough good things about Lumion Serum. I’m always hesitant to try new products, because I have the most sensitive skin... But, after the first time applying it to my skin, it felt exactly like what it’s called “Oxygen.” It’s light, fresh, invigorating & most importantly~has an immediate effect. Not only has it helped reduce fine lines & brighten my skin... it has helped spe...read moreed up recovery time. I use this on my face every day, twice a day, but also have used it on surgical scars. The results speak for themselves. It’s just one of those “Must Have” products. Two pumps of this magical serum & you’ll definitely be hooked too!